Sunday night I made a comment about how our home went from neat Sunday morning to disaster Sunday evening when we were barely home. Chuck just laughed. Please tell me that I am not the only one that experiences that!? Monday took me away from home running errands and then we went out for dinner so not much was accomplished. After a slow start to the morning I told Megan it was time to get up and moving. A day to tidy things was in order! I made Megan her list and then I started on the kitchen and moved on from there. 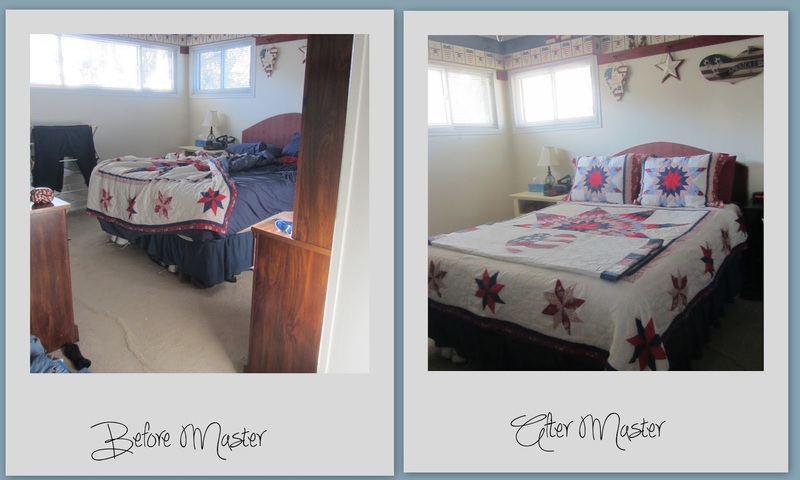 It always amazes me how something as simple as making the bed will make a room seem put together. Megan's room is another story. This is the before and she has worked on it. She even marked tidy room off of his list. Not quite to my standards so we will be going in there together. The only way she will learn tidy is if I continue to teach her. 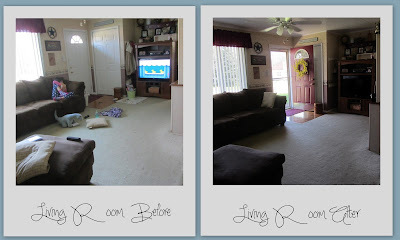 Picking up and running the vacuum make such a huge difference in the feel of a home. Honestly it doesn't take long to do this. Now that things are fairly tidy I am moving on to other task. Laundry is in the works with a load in the dryer and the last one in the washer. The menu for the week has been made. Better late then never, right? Working on the budget is on the agenda also. I hope to get many things accomplished today as I will be out tomorrow morning taking my dad to an appointment. What a wonderful Easter we had! I prepared my food the day before. Green beans with potatoes, deviled eggs and these peep-cakes. All I had to do Sunday morning was put the green beans into the crockpot to heat. Sunday morning we woke up to beautiful blue skies and sunshine. Can you beleive how tall Megan is? It won't be long before she outgrows me! After church we hurried home to change and grab a few things before we headed over to my mother-in-law's. The older cousins hid the eggs and they made the younger ones really hunt for them! We enjoyed the company of extended family along with two families from our church. There was great food, wonderful fellowship and lots of laughter. A wonderful day to celebrate our risen King! It has been a delightful week having Megan home. Chuck took off a couple of days to get some things done. It wasn't all work as we also spent some time out and about. We took Megan the farm store to see the baby chicks. She would love to have a few. I will admit that they are super cute and the idea of fresh eggs is tempting. The thought of the responsibility that comes with it such as cleaning out the coop and the start up cost keep me from saying yes. Grandma was taken out for lunch. There has been lots of home time. There is always plenty of housework to be done. Of course there has been time to play. Megan wrote a heartfelt note to the family of a local fallen officer. We had no idea she was doing this. She came out and asked Chuck to mail this for her. Oh my, how happy this made my heart. It is moments like this that let you know that you are on the right track with parenting. Chuck was able to get his project to the point of paint. We primed the ceiling the night before he returned to work and I primed the walls the next morning. The next time I tackle the ceiling I think I might need a hat! Thankfully I was able to scrub it all out as Megan and I had plans to get our hair trimmed today. Home and family make me a happy woman. I am happy to say that I have enjoyed an abundance of both this week. Tomorrow will be another busy day. A trip to a clothing store, the grocery store and then I need to get started on some things for Easter. There are eggs to dye, food to prepare, and then I need to take time to slow down and prepare my heart. We hope that Chuck makes it home in time to attend the Good Friday service at church. I hope you all enjoy your time with family and especially Sunday service worshiping our risen Savior. Happy Easter! At least it is trying to! There have been some super days temperature wise. We are now back to normal. When I woke up this morning it was in the 30's, but will be climbing to the high 50's by this afternoon. Typical spring! Things are greening up, blooming, and the birds are singing. Oh, how my heart rejoices! I am busy sprucing up the place. A huge load of stuff was taken out of here this weekend. It was taken to my parents attic. The plan is to have a huge yard sale the end of May/first of June. After my kitchen project a few areas have been neglected so I am catching up on some things. Megan is on spring break for the next two weeks. We have nothing planned. There will be plenty of slow time at home. Yes! Chuck is also off today and tomorrow. He is hopeful to get a project to the point of painting. I am looking forward to sleeping in, spending time with my two favorite people and puttering around my home. 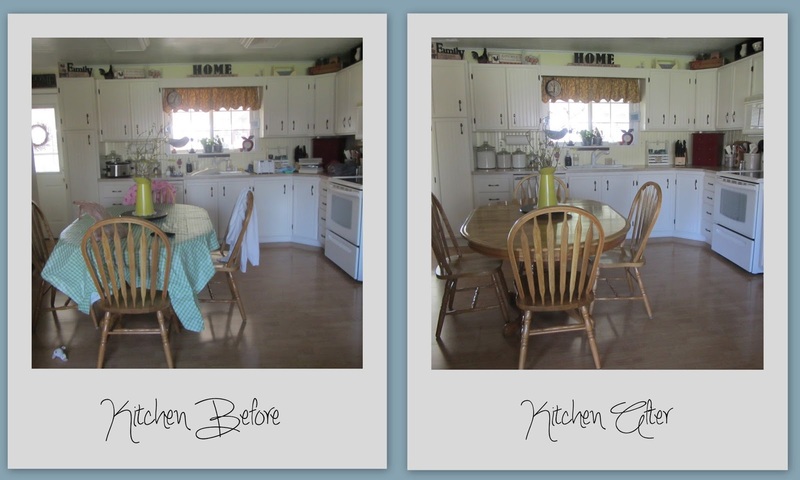 I am finally ready to show you my kitchen refresh! This will be a picture heavy post. You might want to get nice and comfy. I will say that I had a really hard time getting some of these pictures. I could not get the lighting right. So, lets just pretend they all look really professional! ;) Here it is finished. After I painted the walls I knew that cabinets would have to be next. That is the bad thing about painted cabinets they tend to show wear a little easier. An easy, yet, time consuming fix. Painting the cabinets had been on my radar for well over a year. It never seemed to make it to the top of the to do list. I have had my eye on cabinets that had bead board in the center. New cabinets are certainly not in my budget! Last year I had purchased some wallpaper with the look of bead board. Once the doors were prepped I added the paper to the center. My dad has suggested that we run a bead of caulk around the edge to prevent the corners from coming loose. Chuck agreed that was a good idea. My amazing hubby spent an evening taking care of that for me. It really finished them off. Unless you touch them you can not tell that the cabinet doors weren't purchased this way. I painted them antique white. For two reasons. Number one I had the paint left over from painting the end tables and number two my appliances are the color called bisque . Basically off white. I am delighted with how they turned out! Now that all of the hard stuff was out of the way the fun began. I had some things that I had been saving. The thought was that I would use them if we ever moved and I had a larger kitchen. It is not super likely that we will move. I decide that this is where I have been planted and I need to make this a place that I love. An afternoon was spent digging out my treasures and cleaning them up. I started with the corner cabinet. I used an old milk cooler my father-in-law has given me. It says "Loaned by Banquet Ice Cream and Milk Company." I did purchase the milk bottles to go along with it. There is a pottery pitcher peeking out in the back. I added two half gallon jars. One belonged to Chuck's great-grandmother, Dora, and the other one to his step grandmother, Barbara. I also added a jug that we found when we were chasing roots on the old family farm after my grandfather, Pop, passed away. My mom told me that this jug was used to hold homemade root beer. I remember homemade root beer at Mom and Pops! This shelf is above the refrigerator. Chuck went to pick up some steel recycle from my cousin and ended up coming home with a box of vintage Blue Mason jars. He does speak my love language! I repurposed a wooden tray that Chuck had made years ago to hold pots of herbs in the kitchen window. Now I know they won't come tumbling off of the shelf! When Grandma Barbara passed away last year we were able to go through her apartment and take whatever we wanted. I ended up taking a wooden cheese box and an ice pick. I love that the box is stamped with the price! I spruced up the top of cabinets. 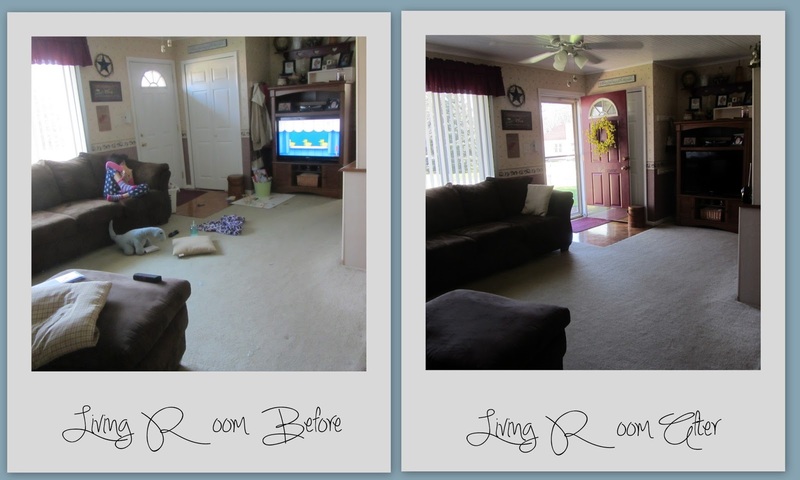 Getting rid of some things, moving things around and borrowing from other areas of my home. 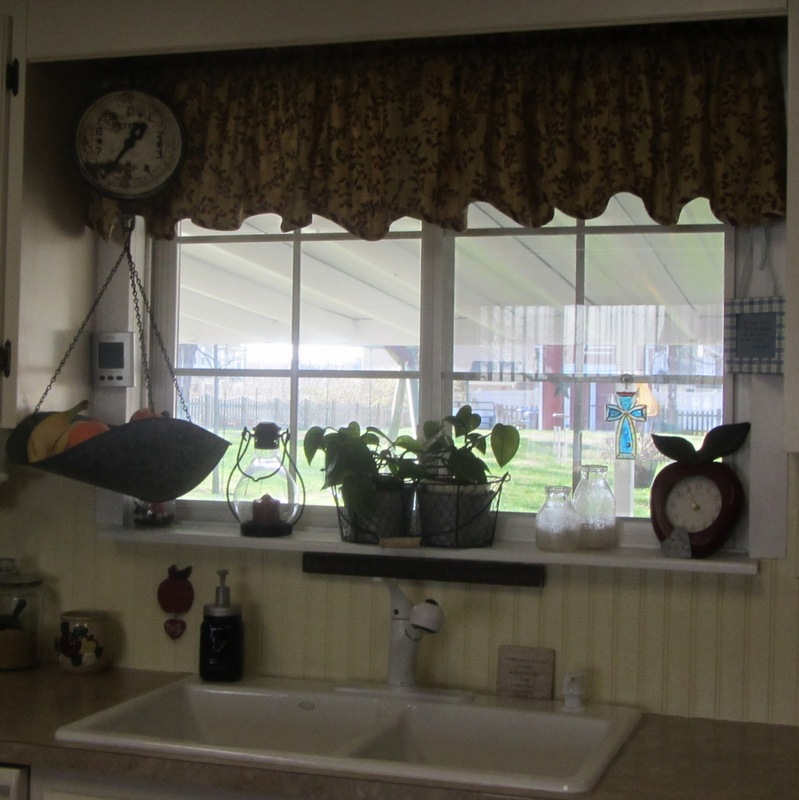 Above the sink I added a new valance, an old scale from my father-in-law, the chicken wire basket that the plants are in is something for my niece's bridal shower. When I purchased it I this is mind with it for after the shower. My favorite thing is the addition of the scale! This is one of the things I was saving for a larger kitchen. I am extremely happy that I decided to go ahead and use it. It makes me smile every time I see it. It is also handy for holding fruit and freeing up counter space! The soda crate is something that my mom gave me several years ago. I am not sure, but I assume it came from her parents. Her parents grew up on farms during the Great Depression and were newly married during WWII. They always had the neatest stuff because they never threw anything away! If I add the wallpaper that was purchased a year ago it would bring the total of this refresh to $61. The thing I like most about this space is that is filled with things that have meaning to me. I am loving this space!